Not to be confused with RAF Lashenden. 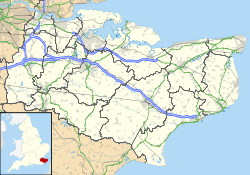 Royal Air Force Headcorn or more RAF Headcorn is a former Royal Air Force Advanced Landing Ground located 2 miles (3.2 km) northeast of Headcorn, Kent, England. Opened in 1943, Headcorn was a prototype for the temporary Advanced Landing Ground airfields to be built in France after D-Day, when the need for advanced landing fields became urgent as the Allied forces moved east across France and Germany. It was used by the Royal Air Force and the United States Army Air Forces. It was closed in September 1944. Two Canadian squadrons, 403 Squadron and 421 Squadron, were based at Headcorn from August to November 1943 with Supermarine Spitfire IXBs. Jefford, C. G. (1988). RAF Squadrons. Shrewsbury, England: Airlife Publishing. ISBN 1 85310 053 6. Wikimedia Commons has media related to RAF Headcorn.